Samira Ibrahim: Egyptian activist says she didn't write anti-semitic tweets. 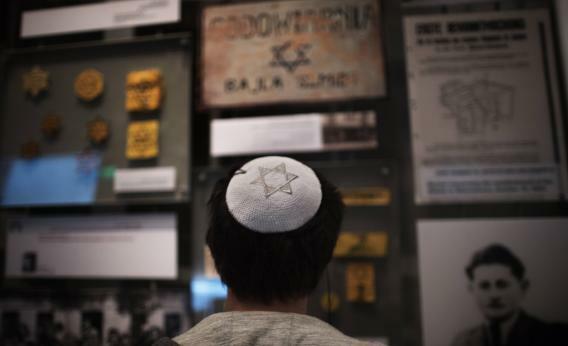 A man wearing a kippa visits the Yad Vashem Holocaust museum, which commemorates the six million Jews killed by the Nazis during World War II, in Jerusalem on the international Holocaust Remembrance Day on January 27, 2013. Jeffrey Goldberg writes about Samira Ibrahim, an Egyptian women’s right activists who (as The Weekly Standard noticed first) keeps tweeting angry things about Jews. Stuff like “I have discovered with the passage of days, that no act contrary to morality, no crime against society, takes place, except with the Jews having a hand in it. Hitler.” Which isn’t much of a tweet! Isn’t this obvious? Ibrahim has been targeted by the same hacker who so cruelly hijacked Anthony Weiner’s Twitter account and posted a picture of Weiner’s underwear-clad erection. Why can’t anybody catch this monster? Why, he won’t even allow his victims delete their tweets after the fact, when the hacking has been revealed!